The Miconieae (Melastomaceae) are a strictly Neotropical group comprising over 1900 species. The tribe is characterized by inflorescences that are terminal or axillary, but not cauliflorous (except a few species of Charianthus, Clidemia, and Mecranium), flowers subtended by only one pair of bracteoles (or none at all), with anthers that lack a pedoconnective, leaves without long acicular raphides, and berry fruits. Generic delimitations within the Miconieae have been notoriously complex, and phylogenetic analyses have shown that Miconia is paraphyletic with many other genera embedded within it. These nested genera include Anaectocalyx, Calycogonium, Catocoryne, Charianthus, Clidemia, Conostegia, Killipia, Leandra, Maieta, Mecranium, Necramium, Ossaea, Pachyanthus, Pleiochiton, Sagraea, Tetrazygia, and Tococa. In the absence of a workable solution that allows the subdivision of the tribe into smaller, morphologically recognizable and monophyletic genera, it has been previously proposed that only one genus be recognized in the tribe. Here we present the necessary taxonomic and nomenclatural changes necessary to recognize Miconia as the sole genus within Miconieae. This work is part of the PBI-Miconieae project funded by NSF (DEB-0818399), with supplemental funding provided by the NSF (DEB-0515665, DEB-1140409, DEB-1343612) and the Richard Lounsbery Foundation. Jefferson Prado and Robbin Moran made invaluable comments to improve this manuscript. ———, W. S. Judd, L. C. Majure, & G. M. Ionta. 2018. Recognitionof Miconia sect. Sagraeoides (Melastomataceae: Miconieae) and associated nomenclatural changes. Brittonia (online). DOI https://doi.org/10.1007/s12228-018-9531-7. Tiernan, N. M. & F. A. Michelangeli. 2018. A revision of the Miconia ulmarioides complex (Melastomataceae: Miconieae). 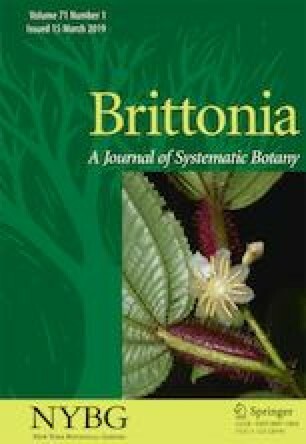 Brittonia (online) DOI https://doi.org/10.1007/s12228-018-9540-6. ——— , F. R. Barrie, W. Greuter, D. L. Hawksworth, P. S. Herendeen, S. Knapp, W.-H. Kusber, D.-Z. Li, K. Marhold, T. W. May, J. McNeill, A. M. Monro, J. Prado, M. J. Price & G. F. Smith. (eds.). 2018. International Code of Nomenclature for algae, fungi, and plants (Shenzhen Code) adopted by the Nineteenth International Botanical Congress, Shenzhen, China, 2017. Regnum Vegetabile 159. Koeltz Botanical Books, Glashütten, Germany. DOI https://doi.org/10.12705/Code.2018.